Want to get all of your personal data from the old phone to a new one after change your phone? Do not worry. Jihosoft Phone Transfer is here to help you.Jihosoft Phone Transfer is a professional third-party tool to transfer contacts, sms, call logs, photos, videos, music, calendar and more from phone to phone. 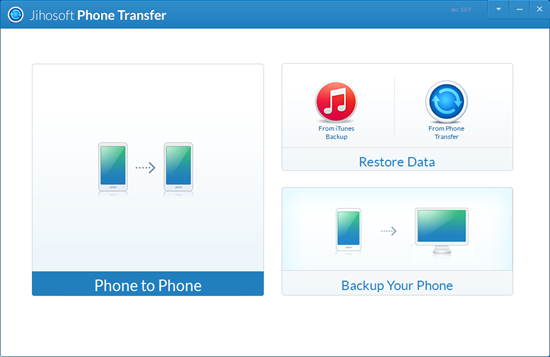 What\'s more, it also supports to backup your phone to computer and restore backup files back to your phone.The following are its main features:- Supports to transfer various data, including contacts, text messages, call logs, photos, videos, music, calendar and more.- Supports to backup your phone data to computer and restore data from the backup file or iTunes.- Supports to transfer between different operating systems. Data transfer from Android to Android, iOS to iOS, Android to iOS and iOS to Android are all allowed.- Easy-to-use. Transfer data with few clicks and no technical skills are required.- Absolutely safe. Only reads and transfers data with original quality. No risk to leak or damage your data.- Compatible with 3000+ devices, including the latest iPhone X, iPhone 8, iPad Pro, Samsung S9/S9 +, Huawei P20, ect. Aiseesoft iPhone ePub Transfer is specially designed for you to transfer eBook ePub to iPhone directly without iTunes. Then you can enjoy eBook more easily on your iPhone. Only one click to import your local source ePub files to iPhone. EZ Backup Word Premium makes it easy to backup your Microsoft Word Documents to a local drive, network folder, CD/DVD and even to a remote FTP server!